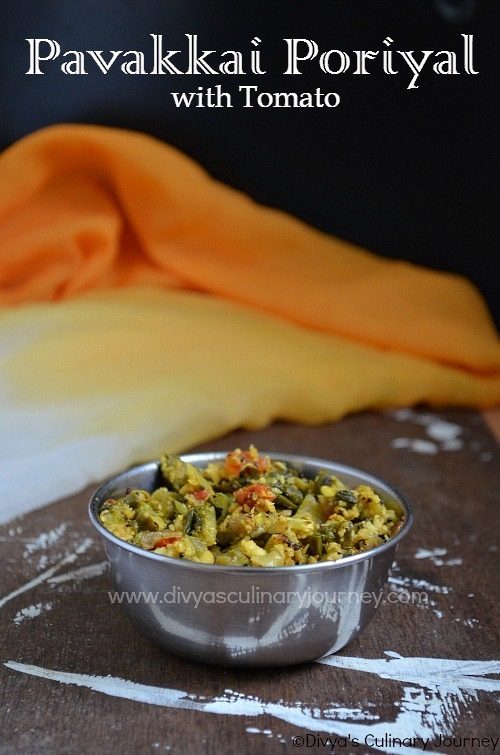 Pavakkai Poriyal is a simple stir fry made with Bitter gourd. This is my mother's version of Pavakkai Poriyal, made using tomato. I have already posted a different version of Pavakkai Poriyal without tomato. My mom makes it by pre-cooking the bitter gourd with turmeric and salt and then stir frying it. This version is also to easy to make and quite delicious. I love this poriyal and everytime mom makes it, I will finish it fully. The usage of tomato in the stir fry cuts down the bitterness of Bitter gourd. Mom makes this stir fry at least once a week. Bitter gourd is diabetic friendly vegetable and it is said that this vegetable keeps blood sugar level in control. Oats Upma is a simple and easy to make Vegan dish. Upma is a South Indian style dish made with sooji or semiya or aval in this case it is made with Oats. As lots of people, prefer eating oats for weight loss or other health reasons like being diabetic etc., I wanted to post some oats recipes here. First I will post some very basic oats recipes, later will post something fancy too. 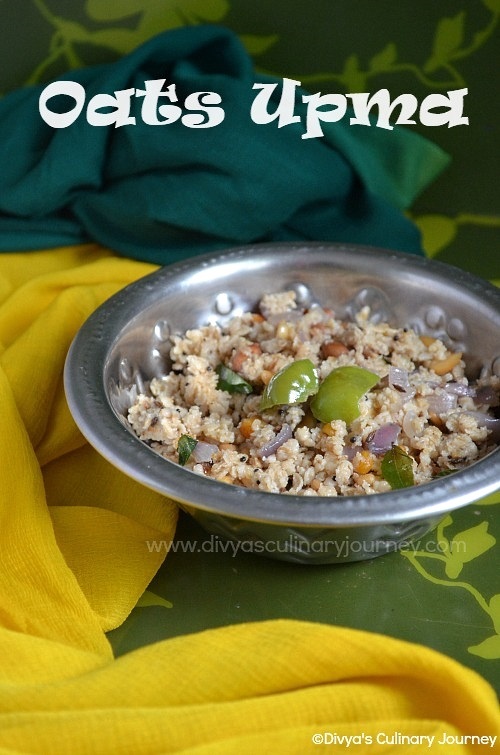 My last post was Oats Bagalabath and today I am posting recipe for Oats Upma. No South Indian needs an introduction to Upma. We make upma almost with everything like sooji/rava, semiya, Aval etc., Oats upma is equally and even more easy to make and is very healthy too. You can add in some veggies of your choice too to make it even more healthy and colorful. But I have posted a simple version of oats upma here. 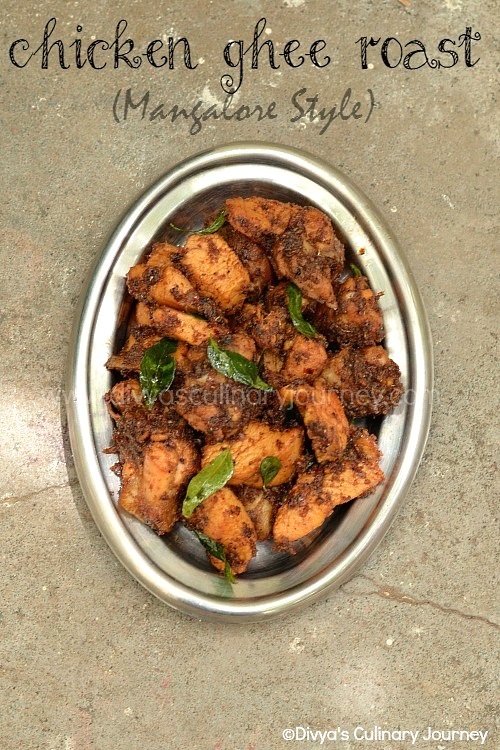 Chicken Ghee Roast is an aromatic and spicy chicken side dish. Our family loves chicken and I wanted to try something different for them than the usual and was googling recipe for Chicken ghee roast and came across this Mangalore style Chicken ghee roast from Cherie's Stolen recipes. I followed the recipe and did 1 or 2 changes like I didn't have kashmiri red chillies so instead used the regular long red chillies I had at home. Kashmiri red chillies are less spicy comparatively and give beautiful color to the dish. Nonetheless, the dish came out really well and everyone at home really loved it. You must try this dish to know what I am talking about. The kitchen was filled with aroma of ghee and spicy and tangy taste of the dish sure did tickle our taste buds. This can be had as an appetizer, side dish for rice, even for roti.